BIBLE: In those days Mattathias the son of John, son of Simeon, a priest of the sons of Joarib, moved from Jerusalem and settled in Modein. He had five sons, John surnamed Gaddi, Simon called Thassi, Judas called Maccabeus, Eleazar called Avaran, and Jonathan called Apphus. He saw the blasphemies being committed in Judah and Jerusalem, and said, 'Alas! Why was I ever born to see this, the ruin of my people, the ruin of the holy city, and to dwell there when it was given over to the enemy, the sanctuary given over to aliens? Her temple has become like a man without honor, while her glorious vessels have been carried into captivity. Her babes have been killed in her streets, her youths by the sword of the foe. What nation has not inherited her palaces and has not seized her spoils? All her adornment has been taken away; no longer free, she has become a slave. And behold, our holy place, our beauty, and our glory have been laid waste; the Gentiles have profaned it. Why should we live any longer?' And Mattathias and his sons tore their clothes, put on sackcloth, and mourned greatly. 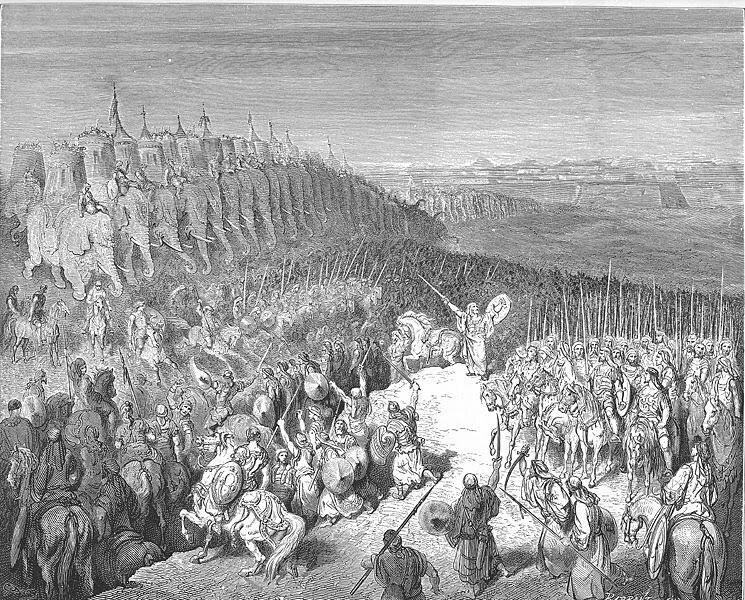 Then the king's officers who were enforcing the corruption came to the city of Modein to make them offer sacrifice. Many from Israel came to them; and Mattathias and his sons were assembled. 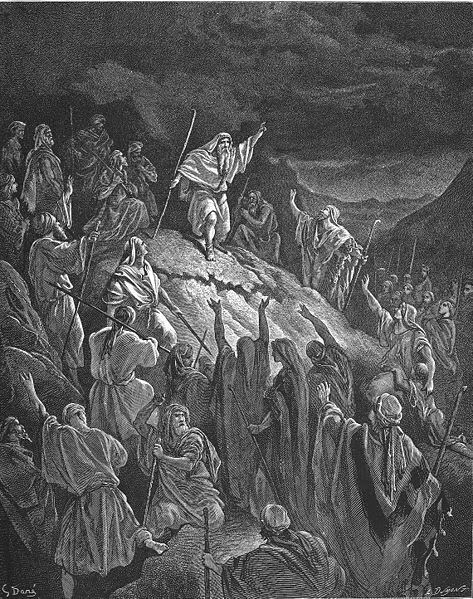 Unmoved, Mattathias answered and said in a loud voice: 'Even if all the nations that live under the rule of the king obey him, and have chosen to do his commandments, departing each one from the religion of his fathers, yet I and my sons and my brothers will live by the covenant of our fathers. Far be it from us to desert the law and the ordinances. We will not obey the king's words by turning aside from our religion to the right hand or to the left.' When he had finished speaking these words, a Jew came forward in the sight of all to offer sacrifice upon the altar in Modein, according to the king's command. When Mattathias saw it, he burned with zealous rage and his heart was stirred. He gave vent to righteous anger; he ran and killed him upon the altar. At the same time he killed the king's officer who was forcing them to sacrifice, and he tore down the altar. BIBLE: Then a company of Hasideans joined with them, mighty warriors of Israel, every one who offered himself willingly for the law. Therefore all who became fugitives to escape their troubles joined them and reinforced their numbers. They organized an army, and struck down sinners in their anger and lawless men in their wrath, the survivors fled to the Gentiles for safety. 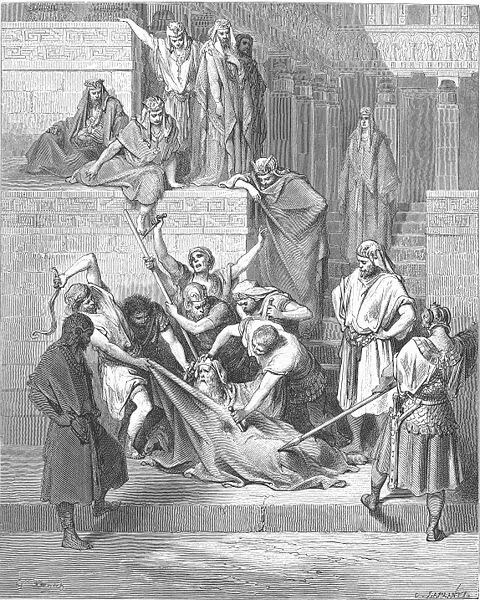 And Mattathias and his friends went about and tore down the altars, they forcibly circumcised all the uncircumcised boys that they found within the borders of Israel. They hunted down the arrogant men, and the work prospered in their hands. They rescued the law out of the hands of the Gentiles and kings, and they never let the sinner gain the upper hand. ''My children, be courageous and grow strong in the law, for by it you will gain honor. Now behold, I know that Simeon your brother is wise in counsel; therefore always listen to him; he shall be as your father. 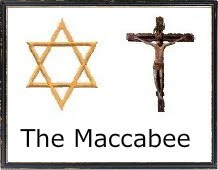 Judas Maccabeus has been a mighty warrior from his youth; he shall command the army for you and fight the battle against the peoples. You shall rally about you all who observe the law, and avenge the wrong done to your people. Pay back the Gentiles in full, and heed what the law commands.' Then he blessed them, and was gathered to his fathers. Mattathias died in the one hundred, forty-sixth year and was buried in the tomb of his fathers at Modein. And all Israel mourned for him with great lamentation and sorrow. BIBLE: Then Judas and his army quickly turned back by the wilderness road to Bozrah; and he took the city, and killed every male by the edge of the sword; then he seized all its spoils and burned it with fire. He departed from there at night, and they went all the way to the stronghold of Dathema. At dawn they looked up and beheld a large company, that could not be counted, carrying ladders and engines of war to capture the stronghold, while attacking the Jews within. So Judas saw that the battle had begun and that the cry of the city went up to Heaven with trumpets and loud shouts, and he said to the men of his forces, 'Fight today for your brethren!' Then he came up behind them in three companies, who sounded their trumpets and cried aloud in prayer. 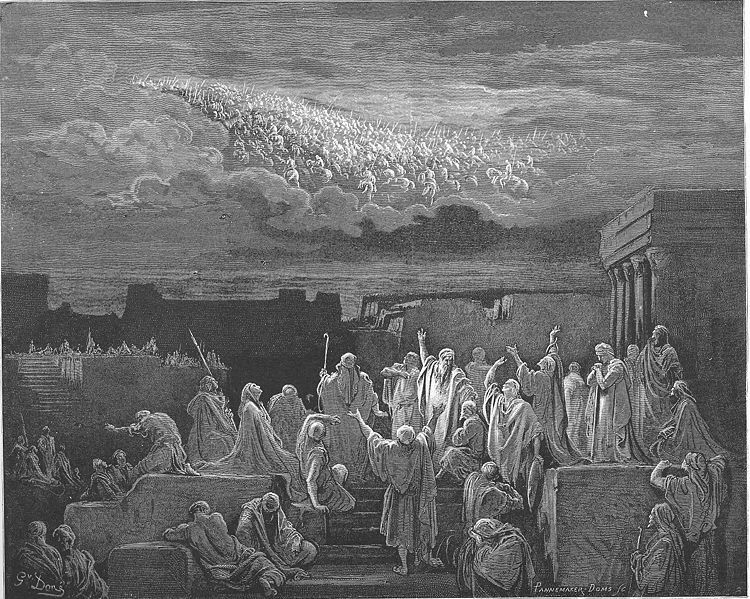 And when the army of Timothy realized that it was Maccabeus, they fled before him, and he dealt them a heavy blow. As many as eight thousand of them fell that day. Next he turned aside to Alema, and fought against it and took it; and he killed every male in it, plundered it, and burned it with fire. From there he marched on and took Chaspho, Maked, and Bosor, and the other cities of Gilead. After these things Timothy gathered another army and encamped opposite Raphon, on the other side of the stream. When Judas approached the stream of water, he stationed the scribes of the people at the stream and gave them this command, 'Permit no man to encamp, but make them all enter the battle.' 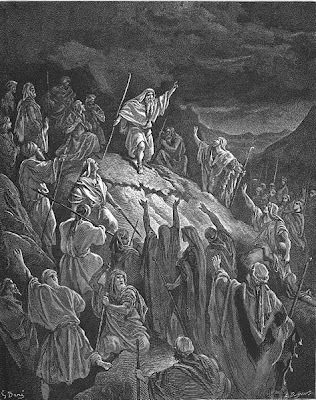 Then he crossed over against them first, and the whole army followed him. 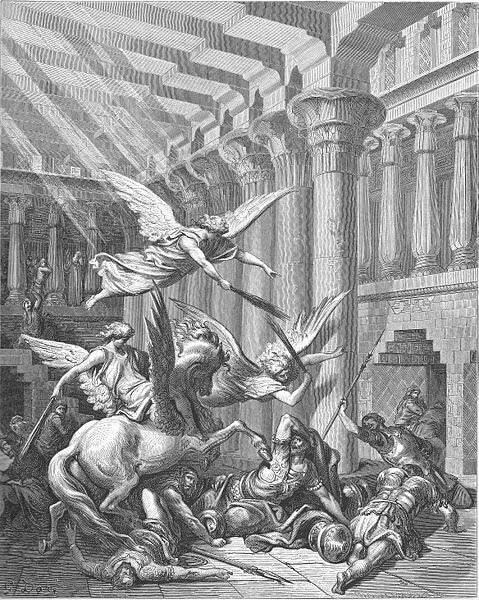 All the Gentiles were defeated before him, and they threw away their weapons away and fled into the sacred precincts at Carnaim. Judas then took the city and burned the sacred precincts with fire, together with all who were still in them. Thus Carnaim was conquered; for they could stand before Judas no longer. BIBLE: Early in the morning the king rose and took his army by a forced march along the road to Beth-zechariah, and his troops made ready for battle and sounded their trumpets. 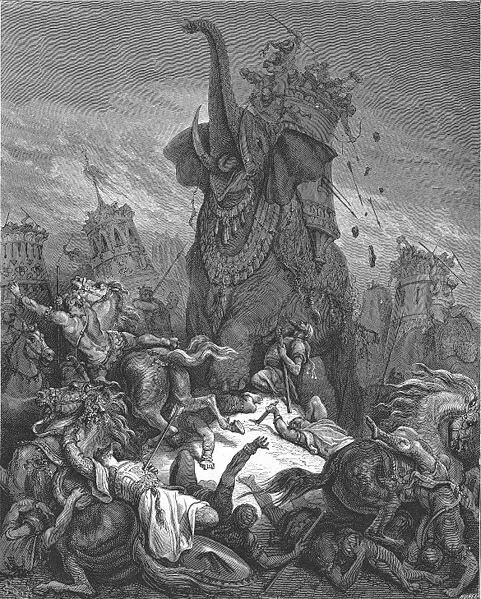 They showed the elephants the juice of grapes and mulberries, to arouse them for battle. And they distributed the beasts among the phalanxes; with each elephant they stationed a thousand men armed with coats of mail, and with brass helmets on their heads; and five hundred picked horsemen were assigned to each beast. These took their position beforehand wherever the beast was; wherever it went they went with it, and they never left it. And upon the elephants were wooden towers, strong and covered; they were fastened upon each beast by special harness, and upon each were four armed men who fought from there, and also its Indian driver. The rest of the horsemen were stationed on either side, on the two flanks of the army, to harass the enemy while being themselves protected by the phalanxes. When the sun shone upon the shields of gold and brass, the hills were ablaze with them and gleamed like flaming torches. Now a part of the king's army was spread out on the high hills, and some troops were on the plain, and they advanced steadily and in good order. 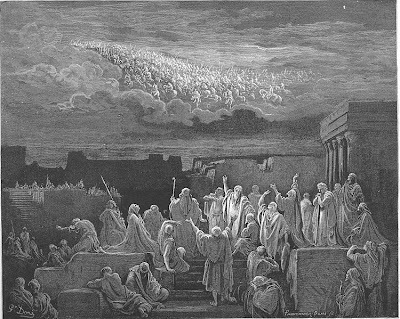 All who heard the noise made by their multitude, by the marching of the multitude and the clanking of their arms, trembled, for the army was very large and strong. But Judas and his army advanced to the battle, and six hundred men of the king's army fell. And Eleazar, called Avaran, saw that one of the beasts was equipped with royal armor. It was taller than all the others, and he supposed that the king was upon it. So he gave his life to save his people and to win for himself an everlasting name. He courageously ran into the midst of the phalanx to reach it; he killed men right and left, and they parted before him on both sides. 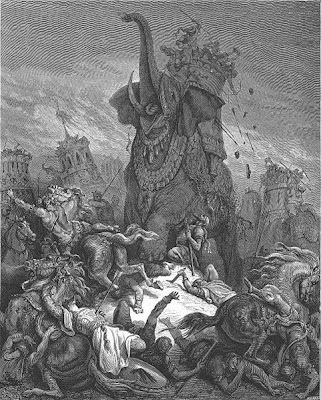 He got under the elephant, stabbed it from beneath, and killed it; but it fell to the ground upon him and he died. Encouraged by the words of Judas, so noble and so effective in arousing valor and awaking manliness in the souls of the young, they determined not to carry on a campaign but to attack bravely and to decide the matter once and for all, by fighting hand to hand with all courage, because the city and the sanctuary and the temple were all in danger. Their concern for their wives and children, and also for brothers and other family members, lay upon them less heavily; their greatest and first fear was for the consecrated sanctuary. And those who had to remain in the city were in no little distress, being anxious over the encounter in the open country. With these words he ended his prayer. Nicanor and his men advanced with trumpets and battle songs; and Judas and his men met the enemy in battle with invocation to God and prayers. So, fighting with their hands and praying to God in their hearts, they laid low no less than thirty-five thousand men, and were greatly gladdened by God's manifestation. When the action was over and they were returning with joy, they recognized Nicanor, lying dead, in full armor. Then there was shouting and tumult, and they blessed the Sovereign LORD in the language of their fathers. So when his accusers saw the honor that was paid him, in accordance with the proclamation, and saw him clothed in purple, they all fled. Thus the king honored him and enrolled him among his chief friends and made him general and governor of the province. Thus Jonathan returned to Jerusalem in peace and gladness. In the one hundred and sixty-fifth year Demetrius the son of Demetrius came from Crete to the land of his fathers. 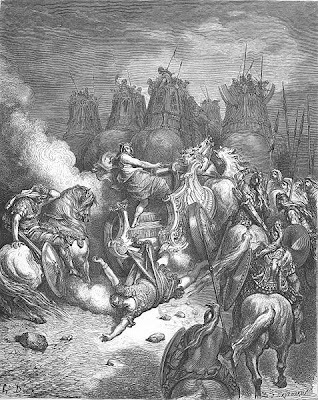 When Alexander the king heard of it, he was greatly sorrowed and returned to Antioch. Demetrius then appointed Apollonius the governor of Coelesyria and assembled a large force in order to threaten Jamnia. When Jonathan heard the words of Apollonius, his spirit was aroused. He chose ten thousand men and set out from Jerusalem, while Simon his brother arrived to help him. He encamped before Joppa, but the men of the city closed its gates, for Apollonius had a garrison in Joppa. So they fought against it, causing the men of the city to become afraid and open the gates, resulting in Jonathan gaining possession of Joppa. When Apollonius heard of it, he mustered three thousand cavalry and a large army, and went to Azotus as though he were going farther. At the same time he advanced into the plain, for he had a large troop of cavalry and put confidence in it. 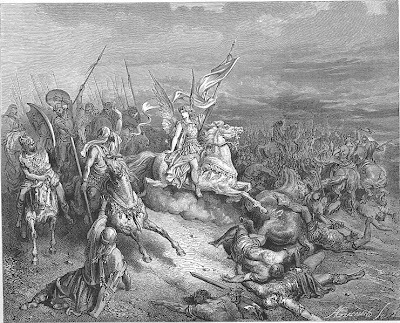 Jonathan pursued him to Azotus and the armies engaged in battle. Now Apollonius had secretly left a thousand cavalry behind them. Jonathan learned that there was an ambush behind him, for they surrounded his army and shot arrows at his men from early morning till late afternoon. Nonetheless, his men stood fast, as Jonathan commanded and the enemy's horses grew tired. Then Simon brought forward his force and engaged the phalanx in battle (for the cavalry was exhausted); they were overwhelmed by him and fled, while the cavalry was dispersed in the plain. They fled to Azotus and entered Beth-dagon, the temple of their idol, for safety. 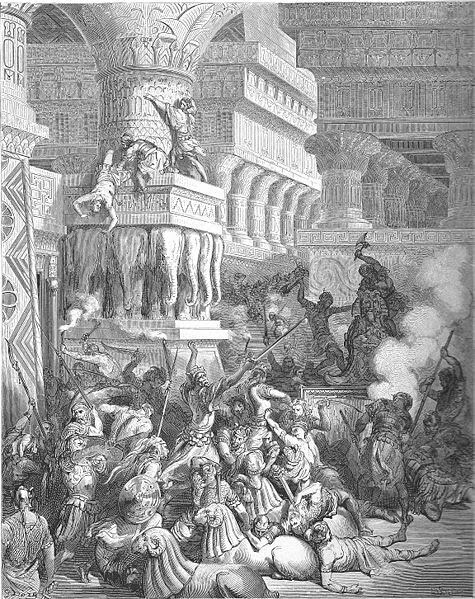 But Jonathan burned Azotus along with the surrounding towns and plundered them, as well as the temple of Dagon, causing those who had taken refuge in it to be burned with fire. The number of those who fell by the sword, with those burned alive, came to eight thousand men. BIBLE: Heliodorus went on with what had been decided. However, when he arrived at the treasury with his bodyguard, right then and there the Sovereign of spirits and endowed of all authority caused so great a manifestation that all who had been so bold as to accompany him were now astounded by the power of God, and became faint with terror. For there appeared to them a magnificently caparisoned horse, with a rider of frightening mien, and it rushed furiously at Heliodorus and struck at him with its front hoofs. Its rider was seen to have armor and weapons of gold. Two young men also appeared to him, remarkably strong, gloriously beautiful and splendidly dressed, who stood on each side of him and scourged him continuously, inflicting many blows on him. When he suddenly fell to the ground and deep darkness came over him, his men took him up and put him on a stretcher and carried him away, this man who had just entered the aforesaid treasury with a great retinue and all his bodyguard but was now unable to help himself; and they recognized clearly the sovereign power of God. While he lay prostrate, speechless because of the divine intervention and deprived of any hope of recovery, they praised the Lord who had acted marvelously for his own place. And the temple, which a little while before was full of fear and disturbance, was filled with joy and gladness, now that the Almighty Lord had appeared. Quickly some of Heliodorus' friends asked Onias to call upon the Most High and to grant life to someone who was lying there nearly at his last breath. And the high priest, fearing that the king might get the notion that some foul play had been perpetrated by the Jews with regard to Heliodorus, offered sacrifice for the man's recovery. While the high priest was making the offering of atonement, the same young men appeared again to Heliodorus dressed in the same clothing and they stood saying, 'Be very grateful to Onias the high priest, since for his sake the Lord has granted you your life. And see that you, who have been scourged by heaven, report to all men the majestic power of God.' Having said this they vanished. Then Heliodorus offered sacrifice to the Lord and made very great vows to the Savior of his life, and having bidden Onias farewell, he marched off with his forces to the king. And he bore testimony to all men of the deeds of the supreme God, which he had seen with his own eyes. 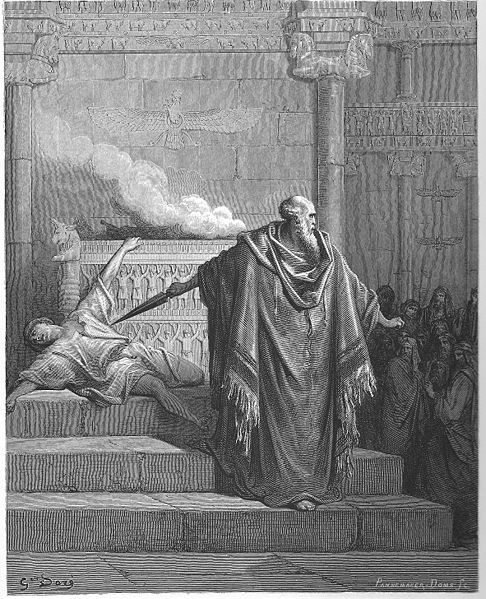 When the king asked Heliodorus what sort of person would be suitable to send on another mission to Jerusalem, he replied, 'If you have any enemy or plotter against your government, send him there, for you will get him back thoroughly scourged, if he escapes at all, for there most certainly is about the place some miraculous power of God. For he who has his dwelling in Heaven watches over that place himself and brings it aid and he strikes and destroys those who come to do it injury.' This was the outcome of the episode of Heliodorus and the protection of the treasury. BIBLE: About this time Antiochus made his second invasion of Egypt. And it happened that over all the city, for almost forty days, there appeared golden-clad horsemen charging through the air, in companies fully armed with lances and drawn swords, with troops of horsemen drawn up, attacks and counterattacks made on this side and on that, brandishing of shields, massing of spears, hurling of missiles, the flash of golden trappings, and armor of all sorts. Therefore all men prayed that the apparition might prove to have been a good omen. BIBLE: Eleazar, one of the scribes in high position, a man now advanced in age and of noble presence, was being forced to open his mouth to eat swine's flesh. But he, welcoming death with honor rather than life with pollution, went up to the the rack of his own accord, spitting out the flesh, as men ought to go who have the courage to refuse things that it is not right to taste, even for the natural love of life. 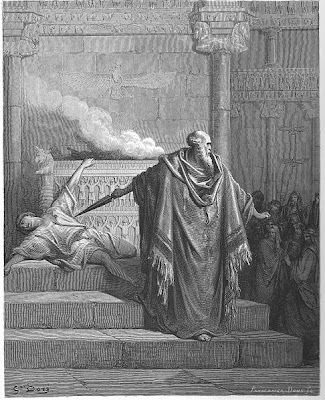 Those who were in charge of that unlawful sacrifice took the man aside, because of their long acquaintance with him, and privately urged him to bring meat of his own providing, proper for him to use, and pretend that he was eating the flesh of the sacrificial meal which had been commanded by the king, so that by doing this he might be saved from death, and be treated kindly on account of his old friendship with them. But making a high resolve, worthy of his years and the dignity of his old age and the gray hairs which he had reached with distinction and his excellent life even from childhood, and moreover according to the holy God-given law, he declared himself quickly, telling them to send him to Hades. When he had said this, he went at once to the rack. And those who a little before had acted toward him with good will now changed to ill will, because the words he had uttered were in their opinion sheer madness. When he was about to die under the blows, he groaned aloud and said: 'It is clear to the Lord in his holy knowledge that, though I might have been saved from death, I am enduring terrible sufferings in my body under this beating, but in my soul I am glad to suffer these things because I fear him.' So in this way he died, leaving in his death an example of nobility and a memorial of courage, not only to the young but to the great body of his nation. The king then fell into a rage and punished him worse than the others, being exasperated at his scorn. So he died in his integrity, putting his whole trust in the Lord. Last of all, the mother died, after her sons. Let this be enough then, about the eating of sacrifices and the extreme tortures. However, the all-seeing Lord, the God of Israel, struck him an incurable and unseen blow. As soon as he ceased speaking he was seized with a pain in his bowels for which there was no relief and with sharp internal tortures -- and that very justly, for he had tortured the bowels of others with many and strange inflictions. Yet he did not in any way stop his insolence, but was even more filled with arrogance, breathing fire in his rage against the Jews, and giving orders to hasten the journey. And so it came about that he fell out of his chariot as it was rushing along, and the fall was so hard as to torture every limb of his body.Thus he who had just been thinking that he could command the waves of the sea, in his superhuman arrogance, and imagining that he could weigh the high mountains in a balance, was brought down to earth and carried in a litter, making the power of God manifest to all. And so the ungodly man's body swarmed with worms, while he was still living in anguish and pain, his flesh rotted away, and because of his stench the whole army felt repulsed at his decay. BIBLE: When Maccabeus and his men got word that Lysias was besieging the strongholds, they and all the people, with lamentations and tears, pleaded with the LORD to send a good angel to save Israel. Maccabeus himself was the first to take up arms and he urged the others to risk their lives with him to aid their brethren. Then they eagerly rushed off together. Once there, while they were still near Jerusalem, a horseman appeared at their head, clothed in white and brandishing weapons of gold. So they all praised the merciful God together as one, and were strengthened in heart, ready to assault not only men but the wildest beasts or walls of iron. They advanced in battle order, having their heavenly ally, for the LORD had bestowed mercy upon them. They hurled themselves like lions against the enemy, killing eleven thousand of them and sixteen hundred horsemen, forcing all the rest to flee. Most of them got away stripped and wounded, and Lysias himself escaped by cowardly, disgraceful flight. Because he was not without intelligence, he pondered over the defeat which had befallen him, and soon realized that the Hebrews were invincible because the mighty God fought on their side. 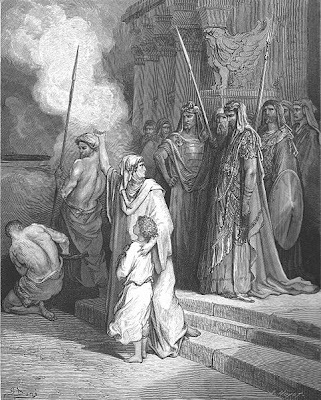 Paul Gustave Dore was born in Strausborg, France in 1832 and by age five was considered a child prodigy, destined for future fame and success. He began his adult career in Paris as a literary illustrator whose drawings were then commissioned by such historical greats as Rabelais, Balzac, Milton, and Dante. By 1853, Gustave then began to illustrate the works of Lord Byron. Other opportunities among British publishers soon followed which included a new illustrated English Bible. In 1863, Doré illustrated a French edition of Cervantes's Spanish Classic Comedy, Don Quixote. In fact, his specific drawings of the knight Quixote and his squire Sancho have become the standard by which many readers understand and visualize the story. By 1883, Doré was then chosen to illustrate an oversized edition of Edgar Allan Poe's 'The Raven.' Gustave Doré's English Bible published in 1866 also became a great success so that by 1867, Doré had a major exhibition of his works in London, which then led to the opening of the Dore Gallery soon after. 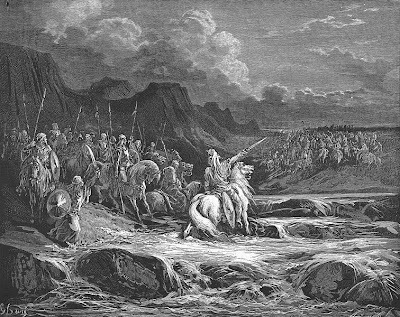 While known primarily for his illustrations, Gustave Dore's wood carvings are world-renowned and are seen by most art historians as more representative of his artistic genius. Although a Frenchman, his fame grew mostly from an English audience, but he did manage to illustrate at least once for nearly all his French literary contemporaries. These particular portraits of the Maccabees are all taken from his Biblical wood-cut illustrations published first in 1865 and again in the late 1860s.